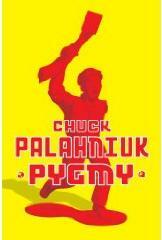 Chuck’s got a new book coming out May 5th called “Pygmy” that the critics are already saying is “his return to the fine form of Fight Club” and his finest novel since Fight Club. …but with references to terrorist cells, commanding the deadly arts and something called ‘Operation Havoc’ which will be unleashed (that sounds an awful lot like ‘Project Mayhem’), I’m sold! I’ve got my copy already preordered at Amazon. Pygmy is one of a handful of young adults from a totalitarian state sent to the United States, disguised as exchange students, to live with typical American families and blend in, all the while planning an unspecified act of massive terrorism. Palahniuk depicts Midwestern life through the eyes of this thoroughly indoctrinated little killer, who hates us with a passion, in this cunning double-edged satire of an American xenophobia that might, in fact, be completely justified. For Pygmy and his fellow operatives are cooking up something big, something truly awful, that will bring this big dumb country and its fat dumb inhabitants to their knees.